NOTE: This is for On-Premise deployment only. When recording session in qTest Explorer, the recorded session data will be uploaded to qTest Session Manager by a service named "qTest Explorer Integration Service". This service runs as a separate process that uploads the data silently and asynchronously without affecting the user experience when working with qTest Explorer. qTest Explorer Integration Service is installed when you installed qTest Explorer Integrated, and it is automatically started by default. If the service failed to start, your recorded session data will not be uploaded to qTest Session Manager that results in a blank session when you view the session in qTest Session Editor. When user attempts to start a new recording session but the service did not start (or not running), qTest eXplorer only allows user to create a new recording session offline, which means the resulting session data can be saved to .trace file or export to various file formats, e.g. MS Word, PDF, JPEG or to submit defect to desired defect trackers. However, the data will not be uploaded and associated to any qTest Manager project. 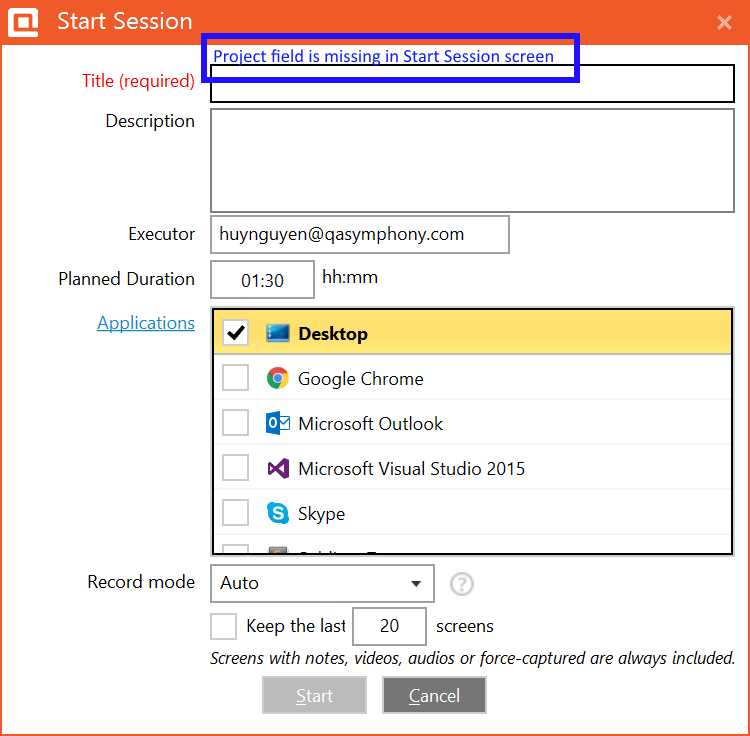 That is the reason you do not see the project field in Start Session screen, as below screenshot. Look for the service name "qTest eXplorer Integration Service"